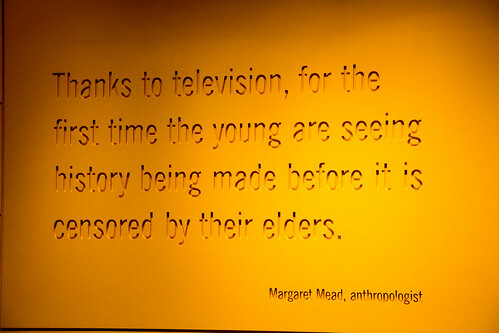 This quote is on a wall in the Newseum, a museum in Washington DC dedicated to news, information (not always the same), and the First Amendment.1I highly recommend a visit if you find yourself with a few hours in the city. Well worth your time. However, with all due respect to Ms. Mead, I don’t think her optimism for television was ever warranted. Even in it’s early days, the medium was controlled by a few corporations run by those elders and the world being viewed by kids, and everyone else, was heavily edited (a nicer way of saying censored) by them. Today that’s even more true, even with hundreds of cable channels, most run by a few large media companies. So, is Ms. Mead’s quote any more valid if we replace television with “the web”? It’s too early to say. The possibility is still there. But only if “the young”, not to mention their elders, learn to filter the crap (see Sturgeon’s Law) on the web from the history being made. Developing that crap detector should be at the core of every school’s curriculum.